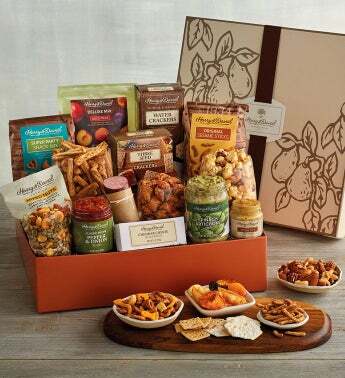 Brimming with sweet and savory goodies, this gourmet assortment is perfect for any occasion. There's something for everyone to enjoy, from caramel Moose Munch® Premium Popcorn and dried fruit mix to snack mixes and peanut butter pretzels. And it's easy to create a variety of delicious combinations with smoked summer sausage, white cheddar cheese, crackers, spinach artichoke dip, pepper and onion relish, and more. Great for hosting get-togethers, bringing as a hostess gift, or sending as a thoughtful gesture.